MUKWONAGO, Wis. -- With a dysfunctional Congress on recess, House Speaker Paul Ryan has turned his focus back home, touring flood-damaged areas and visiting local businesses in Wisconsin. But he can't escape the questions about why Republicans in charge of Washington aren't delivering. And though he's won re-election easily for years, Ryan faces the prospect of challenges from left and right and an energized Democratic base in next year's midterm elections. "We have a majority in the House and Senate and it feels like nothing's getting done," 32-year-old James Hulsey said just before Ryan recently toured his workplace. Sensing the angst, Ryan has been much more visible in his southeast Wisconsin district as Republicans failed to deliver on their yearslong promise to scrap the health care law and new polling numbers show the speaker is less popular among Republicans in Wisconsin than President Donald Trump. Trump won Wisconsin by less than a percentage point, but he carried Ryan's district by 10 points. In the remaining months of the year, Ryan and the Republican-led Congress are determined to deliver major legislation, elusive so far due to GOP infighting, and the top priority is overhauling the nation's tax code. Failure to produce could cost Republicans their House majority in the 2018 midterms and, for Ryan, his job as speaker and Republican leader. "This is the third time in 100 years we've had this alignment of government that we've got to get it done or else I really worried our country will continue down a bad path," Ryan said after his tour of the wire manufacturer Banker Wire, in Mukwonago, Wisconsin. He later told the Wisconsin State Journal, "If we don't do our job, we will depress turnout. I am frustrated as well." Republican Keith Ketzler, 62, worries that the GOP will pay politically next year. Democrats need to flip 24 seats to regain control. "Everybody that voted Republican is getting very frustrated," Ketzler said, after prodding Ryan about why Congress hasn't achieved more. "People crossed the line last time, but they're not going to stay crossed if they don't get things done." Ryan angered some conservatives during the campaign with comments critical of then-candidate Trump. But in the first six months of Trump's term, Ryan has been far less critical of the president than other Republican lawmakers who have challenged a number of Trump moves, including his criticism of Attorney General Jeff Sessions, a former senator. Ryan's Republican primary challenger last year, Paul Nehlen, initially won the backing of then-candidate Trump, who later switched to Ryan. Ryan beat Nehlen by 70 percentage points in the primary. But Nehlen, who is running again, thinks 2018 will be more difficult for Ryan, arguing that he hasn't done enough to appease Republican Trump supporters. "President Trump has given Paul Ryan way more opportunities to stand up and back him and what he has done is really undermine him," Nehlen said. Beating Ryan will not be easy. No Democrat has represented the district since 1995. Ryan has cruised to re-election ever since he joined Congress in 1999 - winning by 35 percentage points last year. He has $11.5 million in the bank and is a familiar face in Janesville where he was born and raised and still lives with his wife and three children. Democrats are pinning their hopes on Randy Bryce, an Army veteran and union iron worker with the nickname "Iron Stache." He appears to have walked out of Hollywood central casting - complete with a dark mustache, thick biceps, faded blue jeans and a promise to fight for the working man. Bryce is trying to capitalize on disenchantment over Ryan's role in the health care bill as he mounts a long-shot campaign. Bryce generated excitement among Democrats both in Wisconsin and nationally for his announcement video in June that has now been viewed more than 550,000 times. It begins with a clip of Trump praising Ryan's attempts to undo Democrat Barack Obama's Affordable Care Act and then shows Bryce getting emotional as his mother details her struggle with multiple sclerosis. "You can come work the iron," the hardhat-wearing Bryce challenges Ryan, "and I'll go to D.C."
Bryce raised $430,000 in the first two weeks after the spot ran. Ryan has tried to shift the conversation from the collapse of the GOP health care effort and toward tax reform and the news that Taiwanese iPhone manufacturer Foxconn plans to invest $10 billion on a factory in his congressional district that could employ 13,000 people. 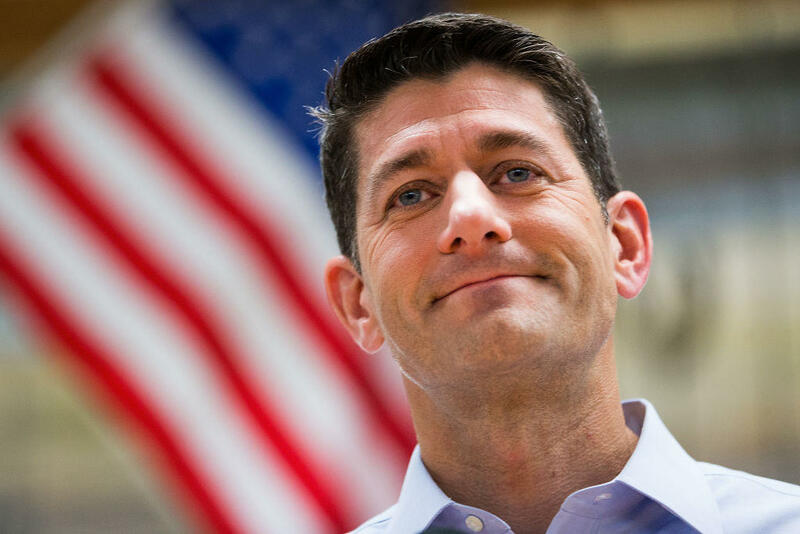 Ryan launched a series of campaign-style online ads highlighting the news that the plant was coming near abandoned automobile factories in his hometown of Janesville and nearby Kenosha. But Ryan's involvement doesn't seem to be resonating quite yet with voters in his district. "Paul Ryan? I don't know what he's done for it," said Republican voter Jeff Lunde of Ryan's role in the Foxconn deal. "They're all working on this stupid health-care crap."